FRISCO, Texas, Jan. 24, 2017 (GLOBE NEWSWIRE) — HRchitect, a leading provider of Human Capital Management (HCM) technology consulting services, announced today that it has been deemed one of Dallas/Fort Worth’s Best and Brightest Companies to Work for. This recognition was earned after a nomination was submitted by the local community and was validated by anonymous, voluntary surveys submitted by its Dallas/Fort Worth based employees to independent analysts associated with the Best and Brightest program. The company was subsequently honored for its innovative and thoughtful human resources approaches at a Dallas/Fort Worth awards ceremony held January 23, 2017 at the Dallas Arboretum. Surveys were sent to a random cross-section of HRchitect employees who work out of the Frisco, Texas headquarters location, producing a 100 percent response rate. The winning companies were evaluated based on key measurements such as communication and shared vision, community initiatives, compensation, benefits and employee solutions, diversity and inclusion, employee achievement and recognition, employee education and development, employee engagement and retention, recruitment, selection and orientation, strategic company performance and work-life balance. Lafata continued, “Many companies like to say that the client comes first, but that is not how it should be. We value our clients greatly, and have over 1,000 across the globe of all sizes and industries. However, if you focus on an employee first culture and treat your employees in the best way possible, they will in turn take care of your clients in the same way. It’s a philosophy that is at the core of our business which includes things such as Unlimited Paid Time Off (PTO), open communication, and more, which in turn has led to very low turnover, and a successful growth rate”. HRchitect would like to extend congratulations to the Grand Hyatt DFW and Total Quality Logistics, two of the company’s clients which were also honored in the Dallas/Fort Worth market. This award is the latest in a series of notable achievements for the company. HRchitect was also recently presented with the 2016 Great Place to Work certification by Great Place to Work ® Institute. 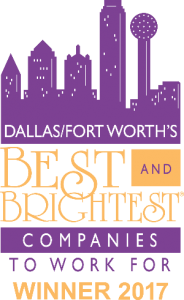 To view the complete list of Dallas/Fort Worth’s Best and Brightest Companies to Work for, please visit http://101bestandbrightest.com/events/dallasfort-worths-2017-best-brightest-companies-work-2/winners/. To learn more about HRchitect, please visit www.HRchitect.com.